Fancy some good news? Well… the limited availability tickets scheme that we introduced in September is no longer in use. Yep, we’re taking things back to how they used to be – allowing you to get your reduced price entry on the door on any Friday or Saturday without having to buy a ticket beforehand. You – along with a guest – will receive priority entry on the door and your fabricfirst membership guarantees that you’ll get the lowest price entry; always. 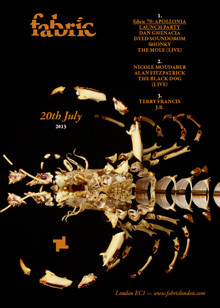 Friday 19th July: FABRICLIVE 70: Friction Launch Party. Not too bad at all, eh? The winner of last month’s Luciano tickets giveaway was Jordan Ward. Nice work! Right, that’s me done. Get in touch if you’d like to talk, or have a comment about anything. 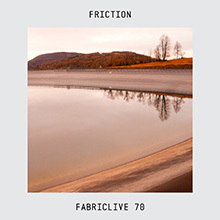 BBC Radio 1’s voice of drum & bass, stalwart of the scene and figurehead of the seminal Shogun Audio label, Friction now unleashes FABRICLIVE 70. Dedicating this mix to ‘the heads’, the mix showcases not only his outstanding technical ability, but also his musical breadth, as he seamlessly moves from deep grooves through hands-in-the-air euphoria and heads-down, tech-edged power – usually with at least two tracks in the mix at any one time. 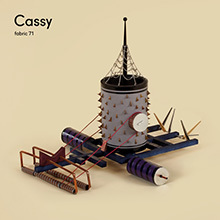 fabric 71 is an intricate mix of stripped-back hedonism and warm sincerity, demonstrating why Cassy holds universal respect within the house music community. 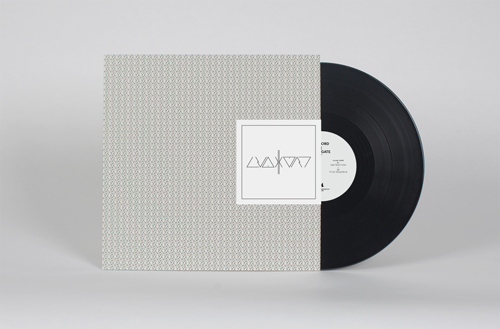 Initially conceived as an outlet for a collective of like-minded artists from the rural outskirts of Manchester, Δkkord have already achieved something of a cult following completely on the merits of their output (two self-released, techno-leaning, dubstep-eschewing EPs which sold out within days). The Navigate EP is endlessly layered with sparse percussion, driving decimated kick drums and rolling dub undertones. Alec Storey is the latest artist to re-christen his output after signing to Houndstooth; progressing from the Al Tourettes moniker to become Second Storey. The Margosa Heights EP has a breadth and experimentation present from the bubbling swells of ‘Arpy Garbles’ to the robotic throng of ‘Still Seas / Just Mortal’. ‘Margosa Heights’ experiments with tension and release, whilst ‘Hebridean Mind Tours’ sprawls out through tempo and structure. Snows Ghosts is the collaboration between Throwing Snow and vocalist Augustus Ghost, and ‘A Small Murmuration’ is their debut album together. The debut single ‘Murder Cries’ was made Zane Lowe’s ‘Next Hype’, with him describing the track as “Phenomenal - one of the best Next Hypes of the year to date,” whilst you can also stream ‘Secret Garden’ from the album on the Houndstooth SoundCloud profile. Paul Woolford's Special Request moniker merges UK house and pirate radio jungle trends, blending infectious rave tunes that could sit in all kinds of sets, from 120bpm techno to 170bpm drum & bass. ‘Wall To Wall’ merges the jacking tradition of Chicago with the UK’s love affair with sub-bass, whilst ‘Broken Dreams’ updates the music of the post-rave period. Meanwhile, Anthony Naples and Lee Gamble offer respectively dense and spacious interpretations of ‘Mindwash’ and ‘Capsules’. 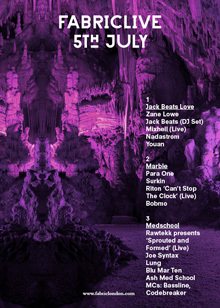 Featured club nights The first FABRICLIVE of July features a bunch of star turns from people like Jack Beats, who’ve invited Zane Lowe and Mixhell to perform in Room One, Marble Players, who host Room Two with Riton performing live and Med School, who bring their future fusion d&b to Room Three. The Apollonia trio (Dan Ghenacia, Shonky and Dyed Soundorom) return to Room One for the first time following their glowingly well received fabric 70 mix. If you thought the last time they hit Farringdon was fun, they’ve got a whole load more in store this time around, including a live performance from The Mole. 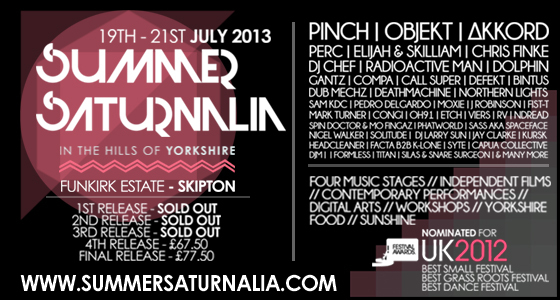 With summer festival season in full swing, it takes a lot to catch our eye when it comes to lineup curation but North Yorkshire’s Summer Saturnalia has done just that with its line up bursting with many of our associates including Pinch, Elijah & Skilliam and Radioactive Man topping the bill which also features Houndstooth signings Akkord and Call Super. In its fourth year of existence this event sees them stick true to their roots of combining local talent with electronic music’s heavyweights all set within shouting distance of Manchester and Leeds. So, it gives us pleasure to offer fabrcfirst members on behalf of the festival organisers a pair of free tickets to the festival over the 19th-21st July this year. To enter just email us with I <3 North Yorkshire in the subject line and we’ll let you know in a week’s time if you’ve won. fabricfirst members can purchase all Houndstooth releases at a discounted rate, and you’ll receive a further discount on vinyl and CDs when you pre-order before release date. We’ll always do our best to deliver physical product to fabricfirst members before release date so you can enjoy it before anyone else (subject to postage). Plus, order vinyl from the Houndstooth or fabric stores and receive WAVs for free upon the digital release date. fabric 70 is a masterclass from the Apollonia boys in building a groove. This collection of 6 CDs of groove-based house can be yours for just £30. For just £30, collect these 6 CDs, sharing the ballsy, genre-bending approach to electro and house displayed by Fake Blood on FABRICLIVE 69.